I cooked this one for dinner with friends and I couldn't be more pleased with how it turned out. Our guests absolutely loved this dish. I think the surprise also comes from the appearance. It looks like it was left cooking too long, when in fact its the caramelized honey that gives it the dish its distinct appearance. Give this one a try, it's a winner. 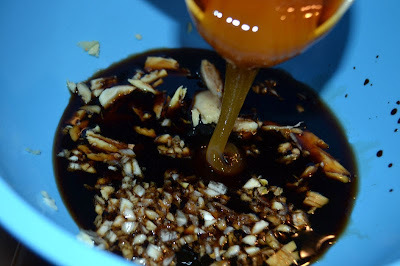 Combine the garlic, ginger, Sprite, soy sauce, and honey in a bowl and mix thoroughly. Give the meat pieces a couple of slices each. 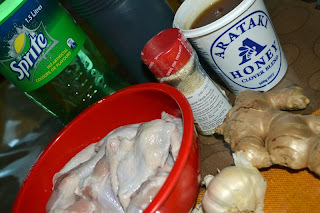 This will enable the chicken to better absorb the marinade, and also cook properly. 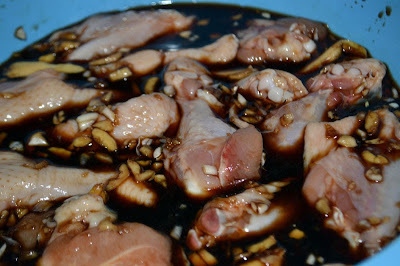 Then add the chicken nibbles to the marinade and leave for an hour. Fry the chicken pieces over low to medium-low heat. It is important to cook this over low heat so that the chicken can cook before the honey caramelizes. We can use the marinade as a dip. Squeeze the juice of 1 lemon and mix with the leftover marinade and boil until it is reduced and slightly thickened. 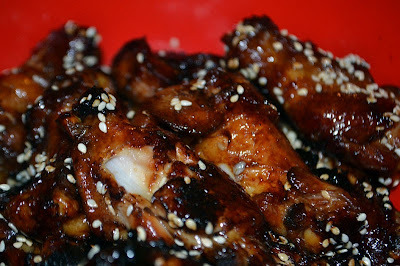 Let the chicken pieces cool, then sprinkle with some toasted sesame seeds before serving with the dip/sauce.